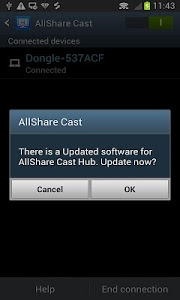 This application provides easy software update for AllShare Cast Dongle! Download and install the application by following the popup messages. Restart for use. 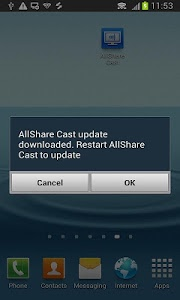 ‘AllShare Cast(or Screen Mirroring)' on Samsung phone provides new sharing function. It technology allows enable content on your Phone screen to be share with a nearby TV or Projector. 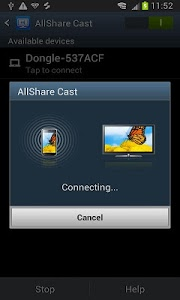 AllShare Cast Dongle supports to interoperate with HDMI enabled device via AllShare Cast and to stream contents. 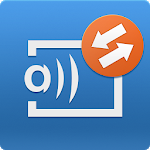 AllShare Cast Dongle allows sharing videos and images with friends and family. Also you can enjoy mobile games on large TV screen. AllShare Cast Dongle (EAD-T10) supports to interoperate with HDMI enabled device via Allshare Cast and to stream contents up to full HD quality through 802.11 a/b/g/n on Samsung mobile. 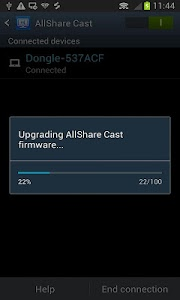 Similar to "AllShareCast Dongle S/W Update"